precarious life & times: What is #precarity and who are the precarious? Instead of narrowing my focus, I have expanded it from precarious faculty to precarious workers across a range of categories from temp work and migrant labor to academic labor and creative culture work. In between extremes lie contract labor, low wage work, work in the service economy, unpaid interns, tech and other knowledge workers. All are insecure, without benefits and usually lower paid than equally (and sometimes less) qualified full time workers for the same employers or working in the same field. Precarious workers, whatever their area or presumed status, are insecure, fungible, disposable, voiceless -- and often invisible or might as well be. Why? Because categories overlap, working conditions and causes are not unrelated. and a wonderful -- strong, not dismissive or demeaning -- image for multitasking, which becomes survival strategy and necessity for those living precariously. UK and European precarious worker movements had more artists and performers -- fairly well formed too by the time"insecure lecturers" joined them. That probably has a lot to do with why they tend to be more creative, less pedantic. 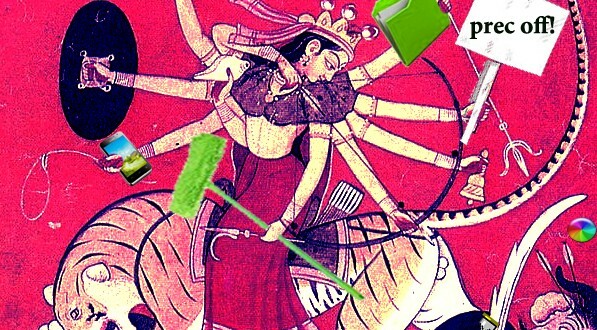 Some year's back on the "new" blog, I used another, more modernized Durga-derived image that would make a highly appropriate "from the archives" post. I can't wait to see it, on your next blog post on the "new blog"! I found the image -- but not on the blog so I'm not sure which post it was. Quite a few older posts are missing images so I just picked one from a search for "precarious workers" and added it. Then I had to fix some bad links while I was at it. But it's ready to go for the next "from the archives" feature -- unless I use it in a new post first.